Whilst working together as contractors Dean and Matt realised they shared a common frustration – that running their contracting business was unnecessarily difficult. They spent too much time fighting with Excel spreadsheets and trying to keep track of all their expenses. Their accountants frustrated them too…Matt and Dean never knew exactly where they stood financially and it seemed that they were paying a large financial price for the inefficiencies of accountants afraid to embrace technology. They knew there was a better way, and they thought they’d found it. Over a busy Christmas period, Dean and Matt shared their idea with Matt’s brother, James. Their concept was simple: create an easy to use, web-based accounting system that handles all of a contractor’s finances in the most tax efficient way possible. James’ background is in technology so he had the skills to turn the concept into a product – he accepted the challenge and inniAccounts was born. Starting with a blank slate, the concept of inniAccounts was drafted out in detail and it quickly became clear that there was a plethora of opportunities to make the lives of contractors and freelancers easier. Their enthusiasm and excitement was also self-serving – between them, Dean and Matt had been running their contracting businesses for over 20 (often frustrating) years and they were both eager to start using inniAccounts to make their own lives easier. It took over a year of sketching, prototyping and testing on Matt’s kitchen table to finalise the key features. Fortunately for our customers, some of Dean’s stranger ideas were binned at this stage. We now had our challenge for the following year: build the software. Development advanced throughout 2007 and progress was quick – the timesheets, invoicing and bookkeeping features were soon complete. The payroll feature had successfully processed HMRC’s test cases and on 19th May inniAccounts produced its first statutory document – a fully completed P14 end of year return (which was more exciting than it sounds). inniAccounts now needed accounting expertise, so the quest began to find a suitable business partner to support our future customers. Finding qualified, experienced accountants who could really understand the benefits of an online accounting system for contractors proved far more difficult than expected, but after months of searching, score of meetings and many late night discussions in motorway service stations Carl – the accounting brain behind inniAccounts – was finally recruited. Spurred on by the successful coding and the expanding team, the public website was launched in June, showcasing the features of the upcoming product and inviting visitors to pre-register their interest. The software was nearing completion, public interest was growing and the challenge was on to launch inniAccounts. As the team reached the final stages of testing it was time to find a virtual home for inniAccounts on the internet. We researched and selected a UK-based hosting partner and ordered the hardware to run inniAccounts. Excitement grew as the servers were installed – and the official launch came closer. The next team member to be recruited was Paul, resident technology expert. Paul has been an IT contractor for many years and he instantly realised the benefits of the service. His colossal knowledge and experience proved invaluable in turning inniAccounts into a polished product, ready for launch. On 1st August 2008, the doors opened for business: inniAccounts went live. inniAccounts all-inclusive accountancy service was proving a hit with first-time contractors. However, requests started to appear from a number of established independent professionals who already had a great accountant and just wanted access to the inniAccounts software to manage their businesses. In April 2009 development commenced on the ‘software only’ product. There were a number of challenges – namely making the processes normally handled by the accountancy team, such as company setup and tax returns, work without manual assistance. The team provided their ideas and Paul worked hard to turn them into reality. In August, James returned from 6 months in Asia and set to work on rebranding inniAccounts in preparation for the launch of the new service. No pixel was left untouched – the software got a brand new look and feel, inniAccounts’ brand had a makeover and a new public website went live. Report Centre – a dedicated area offering a range of insightful reports, with an option to download in PDF, Word or Excel format. 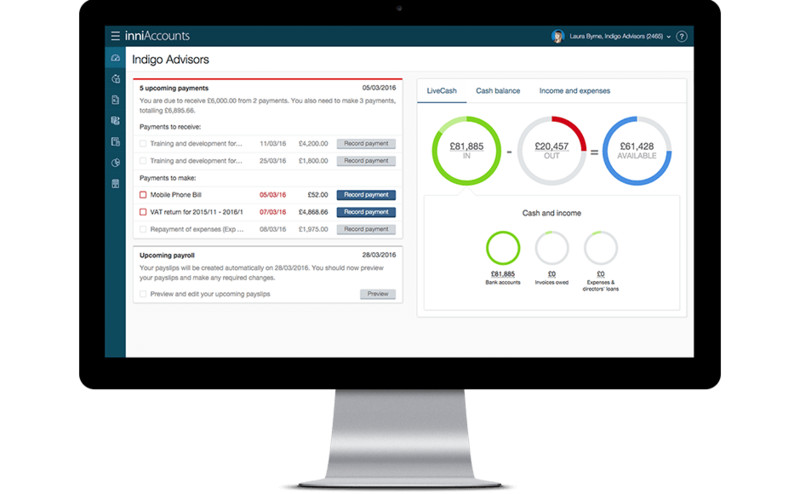 inniAccounts Mobile – providing clients access to LiveCash and quick entry of timesheets, expenses and mileage on the move. 2010 also saw the launch of our secure, online help centre, which offers our customers a straightforward and very efficient way of resolving queries, accessing information and getting support when they need it. In 2011 the inniAccounts team has continued to expand – the newest addition to our account management team is Rachel, who dedicates her time to resolving the day-to-day enquiries and needs of our growing customer base. We’ve also launched our highly successful referral scheme and made further improvements to our core software and services, all of which has had a very positive impact for customers, and has allows us to stay ahead of the competition in terms of software, support and customer service.